Plot for detecting influential observations using DFFITs. DFFIT - difference in fits, is used to identify influential data points. It quantifies the number of standard deviations that the fitted value changes when the ith data point is omitted. 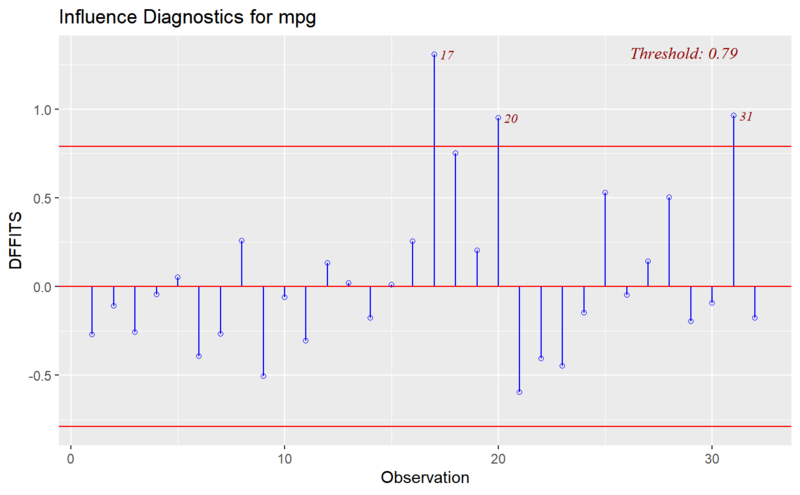 where n is the number of observations and p is the number of predictors including intercept. ols_dffits_plot() has been deprecated. Instead use ols_plot_dffits(). Wiley Series in Probability and Mathematical Statistics. New York: John Wiley & Sons. ISBN 0-471-05856-4.